Kia’s first product announcement of 2015 has come in the shape four new special edition 'SR7' hatchbacks, fittingly focused on high value and on sale now. The SR7 special editions of the Rio, Venga, Carens and Cee’d replace the VR7 models and add a bit of extra equipment to the mix. Kia is naturally touting the value of these models, and just taking the cheapest of them as an example, the outgoing Rio VR7 three-door retailed at £11,595, while the new three-door SR7 is £10,345. The Venga 1.4-litre petrol SR7 is £13,595, the Cee’d 1.4 SR7 £15,650 and the Carens 1.6 SR7 £19,295. Diesel variants are available, with the entire four-model SR7 range beginning at £10,345 and ending with the 115PS 1.7-litre diesel Carens 4 SR7, at £27,055. Every SR7 has LED daytime running lights, cornering lights, front fog lights, tinted windows, dual-zone air conditioning, and alloy wheels unique to the trim level. All get Bluetooth audio streaming too, or a USB port to plug your vintage iPod into if needs be. The engine range powering the SR7 models spans from a 1.25 85PS petrol unit in the Rio, through a 1.4-litre 90PS unit in the Venga and Cee’d, a 100PS petrol of the same capacity, and a 1.6-litre with 135PS in the Carens. 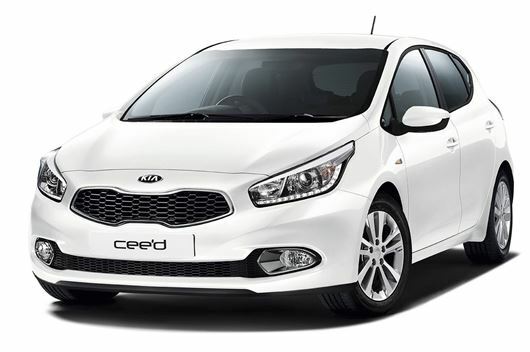 Diesel engine choices are a 75PS 1.1-litre unit in the Rio, a 90PS 1.4-litre CRDi in the Cee’d, and a 1.7-litre 115PS oil-burner in the bigger Carens and Carens 4. Both the Rio and the Cee’d SR7 models come in three-door or five-door formats, the latter car named Pro_Cee’d, of course.